American viewers saw him reprise the role in the acclaimed mini-series “War and Remembrance” (1988-89), but he also played Churchill in two 1980s television movies, “The Woman He Loved” and “Bomber Harris”; a London stage production, “Winnie” (which The Guardian pronounced a “feeble musical”); and a French play, “Celui Qui a Dit Non” (1999). And his last screen appearance, other than a role in a film short, was as the star of “Churchill: 100 Days That Saved Britain,” a 2015 British television movie. Mr. Hardy had a prolific screen career over seven decades. He was hailed for his portrayal of Henry V in the 1960 British mini-series “An Age of Kings,” and of Robert Dudley, Earl of Leicester, in “Elizabeth R,” the mini-series starring Glenda Jackson, which was shown in the United States in 1972. 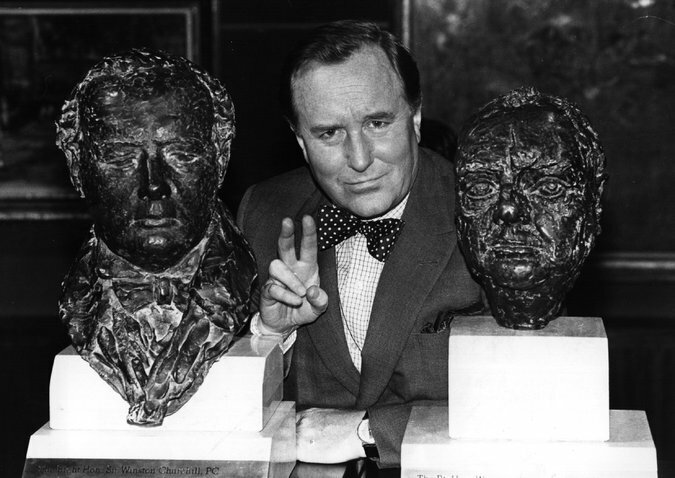 Mr. Hardy in 1980 between two busts of Winston Churchill. His portrayals of Churchill defined him for many British audiences. He had memorable roles in films like “Sense and Sensibility” (1995), “Mrs. Dalloway” (1997) and “Mary Shelley’s Frankenstein” (1994). And he appeared in “The Shooting Party” (1985), a British drama about thoughtless pre-World War I aristocrats. The movie almost wasn’t made after Mr. Hardy, Edward Fox and the film’s star, Paul Scofield, were injured while filming a scene. As Reuters described it, “a runaway horseless carriage overturned,” leaving Scofield with a broken leg and the others with cuts and bruises. Scofield had to be replaced, by James Mason, but Mr. Fox and Mr. Hardy carried on. Timothy Sydney Robert Hardy was born in Cheltenham, England, in the Cotswolds, on Oct. 29, 1925. He was the youngest child of Henry Harrison Hardy, headmaster of Cheltenham College, and the former Edith Dugdale. He attended Oxford University and served in the Royal Air Force before beginning his acting career in Stratford-upon-Avon with the troupe that later became the Royal Shakespeare Company. Although he was best known for his screen work, he had a notable stage career. His London debut was as Claudio in John Gielgud’s production of “Much Ado About Nothing” (1952). Working with the Old Vic theater company in the early 1950s, he appeared in a variety of roles, including that of Laertes to Richard Burton’s Hamlet. He also appeared on Broadway twice, although both productions — “Someone Waiting” (1956) and “Four Winds” (1957) – had extremely brief runs. Mr. Hardy was an author, too. Inspired by an early Shakespearean role, he became fascinated by archery, particularly one ancient British weapon, and wrote “Longbow: A Social and Military History” (first published in 1976). It is now considered a classic reference work on the subject. He was married twice, to Elizabeth Fox (1952-56) and to Sally Pearson (1961-86). His survivors include a son, Paul, and two daughters, Justine and Emma Hardy. He was made a Commander of the British Empire in 1981. Mr. Hardy’s acting ambitions began in early childhood, he once told the BBC, when he served as a page at a wedding.